9 year old Aaron Jackson Jr. (4'8", 84lbs) lived in a green cinderblock house at 818 Norwood Rd with father Aaron Jackson, Sr., a Stone Mountain roofer. He had two older sisters (Patricia, 16, and Lisa, 12) and brothers Kevin and Lee. 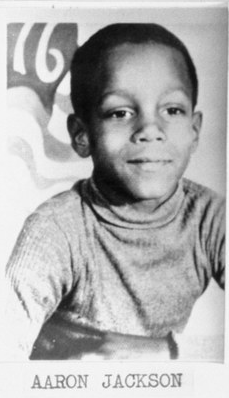 His mother, Benny Jackson, stayed with his other two siblings in Washington D.C. when Aaron left with the other children two years before. His aunt lived next door to him. Jackson attended Dobbs Elementary and had friends in Thomasville Heights (and knew Aaron Wyche and Patrick Rogers). Jackson had befriended a woman named Ms. Williams. He also swam at the Thomasville Heights Recreation Center. Aaron Jackson went missing from Moreland Avenue Shopping Center. He was wearing a printed shirt, dark pants and sneakers. 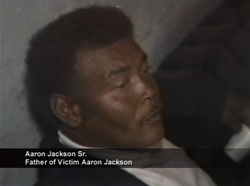 Aaron Jackson's body was found off Forest Park Road on the southeast bank of the South River beside the bridge (approximately a block from the Lake Charlotte a.k.a. Lake "Charolette" entrance). His body was missing socks, wearing blue jeans, white shirt with brown designs, and black tennis shoes. The listed cause of death was "asphyxiation by suffocation." In 1981, an attorney was found murdered here, left by two youths. The funeral was held Saturday at 1pm at Bible Way Church of Our Lord Jesus Christ Apostolic Faith (1849 Thomasville Dr. SE) with the remains lying in state from 10am. Bishop Matthew Norwood officiated. He was buried at Southview Cemetery. The cortege was at noon and visitation was held Friday from 9 to 10:pm, in the Hines' West Chapel.